Buon Giorno! I am Maria Fracasso, in Maddie Day's Country Store Mysteries series. I am say I apologize now, my English is not so good. But I married to Robbie Jordan's papa, Roberto Fracasso, and we visit Robbie in Indiana. She such a nice girl. Maddie Day, she write the adventure we had in Death Over Easy, and she want to give you advance copy of the book. So you be sure you comment at end and include your email address, yes? So we, Roberto and me, we go visit Robbie. We stay upstairs in her new bed-and-breakfast room. We go in June during big bluegrass festival. She tell us bluegrass is not blue grass but is American music. We visit festival, but next day banjo-playing lady is killed! I am frightened, especially after polizia learn Roberto and I, we know dead lady's twin sister back in Italia. But we stay a while, we listen to music, and Robbie? She is good at solving the mystery. You should read the book. Maddie, she say I ask questions, and remind that one of you win early copy of her book. So, you like bluegrass music? You have favorite group? Or, you ever go to Italy? What your favorite Italian food? 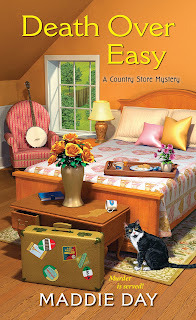 Maddie Day creates the Country Store Mysteries and the Cozy Capers Book Group Mysteries. As Edith Maxwell, this Macavity- and Agatha-nominated author writes the Quaker Midwife Mysteries, the Local Foods Mysteries, and award-winning short crime fiction. Maxwell is President of Sisters in Crime New England. She lives north of Boston with her beau and two cats, and blogs here, with the other Wicked Cozy Authors, and at the Midnight Ink blog. You can find her on Facebook, twitter, Pinterest, and at her web site, edithmaxwell.com. Oh wow this is going to be a fantastic edition to an already great series! Yes I love Italy, I used to go to the Lakes and then once or twice a trip I would go to Verona to watch the opera in the arena (take a cushion and an umbrella! ), favourite Italian food - pretty much all of it lol but Pizza Margarita done correctly is always a winner. Hmm don't think I know Bluegrass music - so can't help there! Italy is on my bucket list..I love lasagna.. I have heard bluegrass music in event backgrounds, but I do not know specific bands' names...Enjoy your stay in Indiana, Maria...! This is one of my favorite series. I’m looking forward to reading this. Being of Italian decent I love my Italian food! Wish I could be in Italy taking an Italian cooking class! Would love to win a copy of this book. What can I say - we LIVE in the Folk Music Capital of the World. :) Folk music and bluegrass are closely related - not quite sisters but not as distant as cousins either. We do have a bluegrass festival in town twice a year and we attend all nights of both of them. Love all the groups so can't pick a favorite. Love - love - love the cover! Adore that there is a banjo on the cover and a banjo player in the story. My husband is learning to play the banjo three finger style first and then claw hammer next plus he just learned of a two finger brush style he wants to learn. Thoroughly enjoy listening to him playing - even practice. Thank you for the chance to win a copy. I would be thrilled to be the very fortunate one selected. Love all your books! I am so glad there is a new book for this series! I had the chance to visit Italy only for a day. I would love to go back and take my time to soak up all there is of the culture, the beauty and,of course,the food! I would love to visit Italy. I love all kinds of Iatalian food. I like bluegrass music. My mom listens to it a lot. Even though I live in KY where there is quite a bit of bluegrass music, I am not a fan. But, this book's premise looks intriguing. I've read them all and enjoyed them immensely. I can't wait for the next story to hit the shelves. I love bluegrass, especially the early stuff. I've never been to Italy, but I'd love to go. And I'd really love to read and review an ARC of Death Over Easy! bobwiesmann (at) gmail (dot) com. Nancy, you are the winner! Check your email, and congratulations. I'm looking forward to this book! ljbonkoski@yahoo.com My favorite Italian food is Lasagna. I don't like Bluegrass. I've never been to Italy, however I would love to visit one day. As far as Italian food, I'm a sucker for pasta. I like Bluegrass music. I have never been to Italy, but I would love to visit Italy one day. Not a pasta fan. Nancy Schwenker is our lucky winner. Congratulations, Nancy - and I wish I had an ARC for everyone! I love music, and I enjoy any type of pasta, like lasagna and more.and I just saw I'm too late. Congrats Nancy.